The Society provides financial assistance to those within the service, both in a hospital and at home. That assistance pays for the unique and personal health-related needs of individuals at a time when they are most needed. For some wishing to stay at home, it could mean oil in the tank that ensures the home stays warm. For others wishing to see their loved one, it could mean the fare that brings them to their bedside. In some cases, it has meant enabling that special celebration, whether it’s a birthday, graduation or a wedding, making for lasting family memories. The Society will step in to help when medical and nursing staff alert them to the needs they encounter for the individuals and families in their care. For example, the cost of ambulance transfers has been covered, as have parking passes, or the cost of a trip to the hospital for much-needed treatment. Family members have received gas cards to enable a visit to a loved one, groceries when the cupboards are bare, and blankets and books for someone who needed both. Whatever is needed to help someone stay in their preferred environment, it is done. Any equipment needed to make it possible for individuals to stay at home is provided. In this way, they are surrounded by the people and in the environment, they are most comfortable. Sometimes, the funds will go to renting hospital beds, or equipment to modify the washroom, hygienic products for adults—whatever is needed to ensure the comfort of the individual. Additionally, when noel nursing care is needed for a night or two to provide rest for the family when a loved one is in the last stages of life, the Society can help to provide it. The dedicated medical and nursing staff who provide care to individuals both in a hospital and at home are able to stay current and can take advantage of professional development opportunities thanks to the support of the Society. Staff are able to attend conferences or take in courses that ensure they have access to the most up-to-date practices within the spectrum of palliative care. For families who are left to mourn after a loved one is gone, bereavement support can be extremely critical. Knowing that you are not alone when you are grieving, that there are places to turn, can provide a vital lifeline at a time when emotions can feel overwhelming. 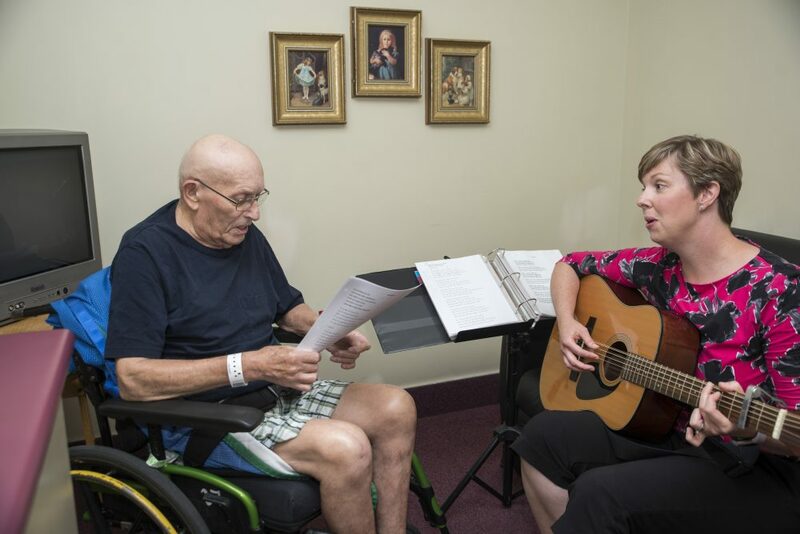 Music therapy is also funded by the Society and the Cape Breton Regional Hospital Foundation. This program brings the gift of music in many forms, whether as a legacy cd, through the build-a-bear program or through the simple joy of hearing your favourite song when you need it most. Recently, Music Therapist Jill Murphy learned one of her clients was a big Johnny Reid fan, and wondered if attendance at an upcoming concert could be arranged. Thanks to Hospice staff, this individual was able to not only attend the concert but had an opportunity to meet the singer, receive a kiss and a cuddle and get a photo with him! For her, it was a truly magical night and provided an immeasurable amount of comfort and joy. Your gift means so much to so many. Your generosity helps us to touch lives with comfort, care and compassion. Because you give, so can we.